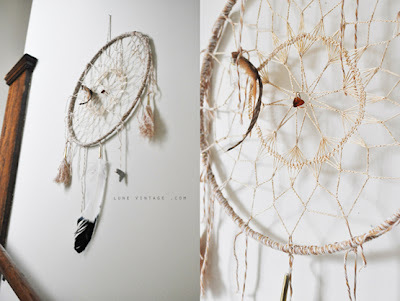 I've always liked dreamcatchers. Natives have something magical, such a deep understanding of Nature. Though I've had a couple of dreamcatchers it never took my nightmares away, and I had it hanging right over my head. 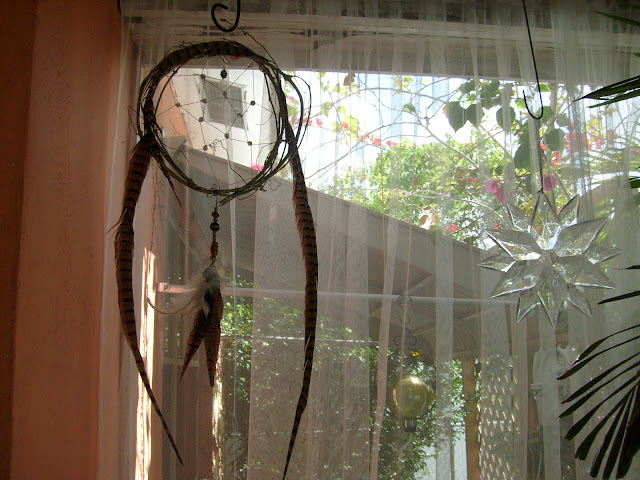 I decided it would be simply decoration, so I added glass icicles to it and it tinkles like delicate chimes. One small one I keep in my car. I love seeing them and that they have mystical aspects. So with the materials I have especially the grapevine, I made one and it was very pretty! I like making them. I have made a few. 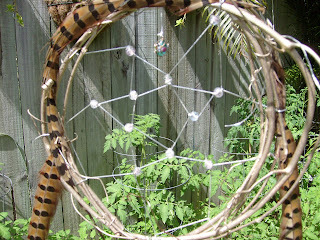 I like the therapy it offers when hands are busy crafting, weaving, seeing with my Magical Eye. I wanted to make all kinds since I saw so many possibilities, and that they are truly endless using all kinds of materials. ............or jewelry you no longer wear but still love.......my next one. I went to Joann's to pick up rings, and right underneath were some white lace doily's, and I saw it immediately. 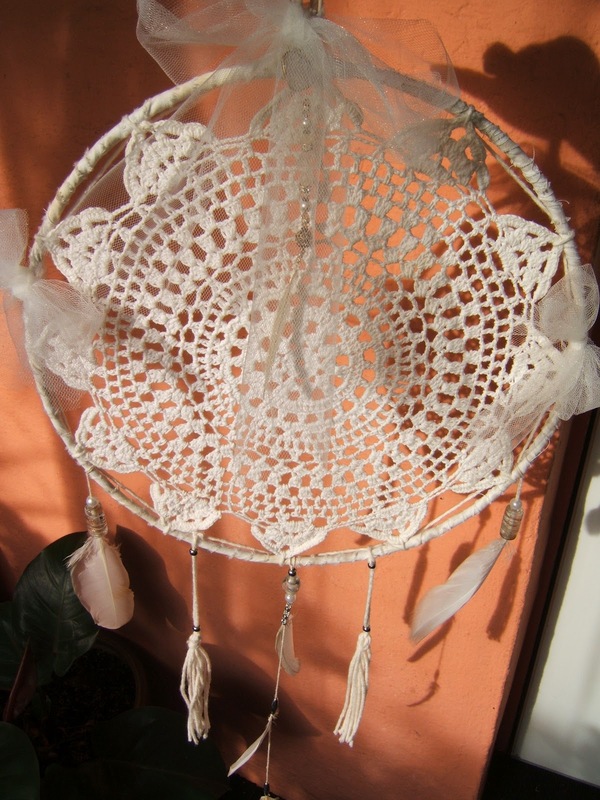 The doily would be the woven web part and I wouldn't even have to weave it. I bought the rings as I had everything else. Here are a few I've made. I wish the pictures were a better quality.....one day. 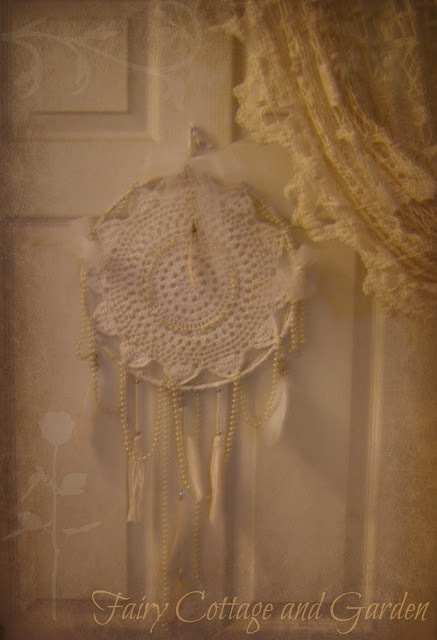 This first dreamcatcher is ala Rachel Ashwell who has again, after 10 years, become a muse for me. 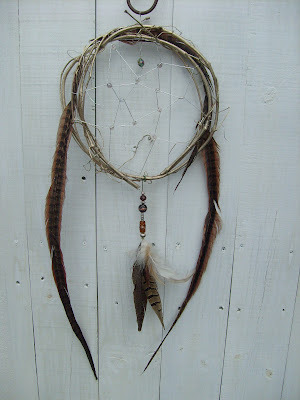 Tausha of Simply Me blog makes some like these to sell, she deserves a mention because they are beautiful. I like this one as I love almost everything by Rachel, and though I don't like to copy, it was simple enough and because its made of fabrics, I decided it would represent my artistic muse since I'm making my clothes. I got Joann's precut squares in coordinated colors and patterns for $1.99. The rest of the materials I had. 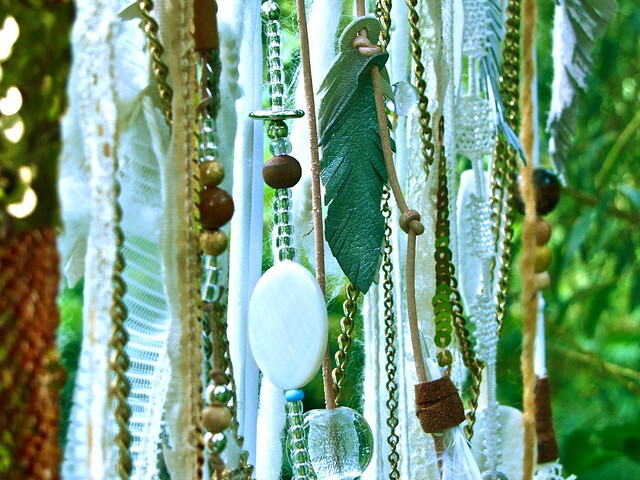 This one is magical because it has a bit of everything I use in my creativity and clothes....beads, pearls, netting, fabric, feathers, crystals. It is the one that reminds me that I love to make clothes and I love fabrics, beads and lace. I wove a star in the center. I've not seen that before. I always have to do something original. It is my Creative Muse DreamCatcher. I love this one as it uses the grapevine I grew here, beads I had, and pheasant feathers. 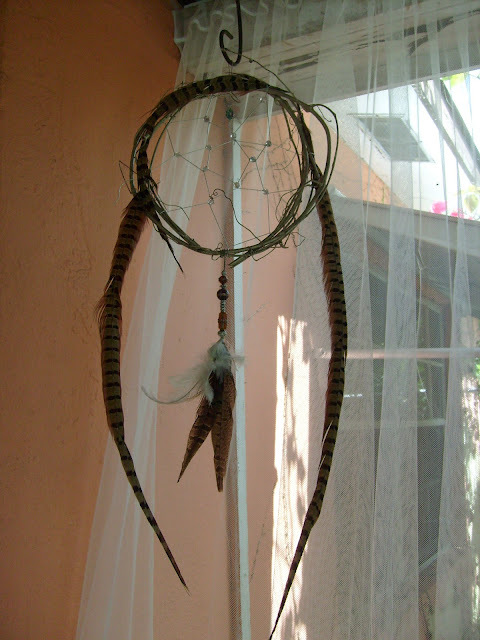 I had some feather thingys that were a mix of feathers, and I hung it upside down, added beads to its stem and attached it. Beauty. Made from things from Nature...web uneven......... and like nature, is perfect imperfection. This is my lacy white whimsical one. 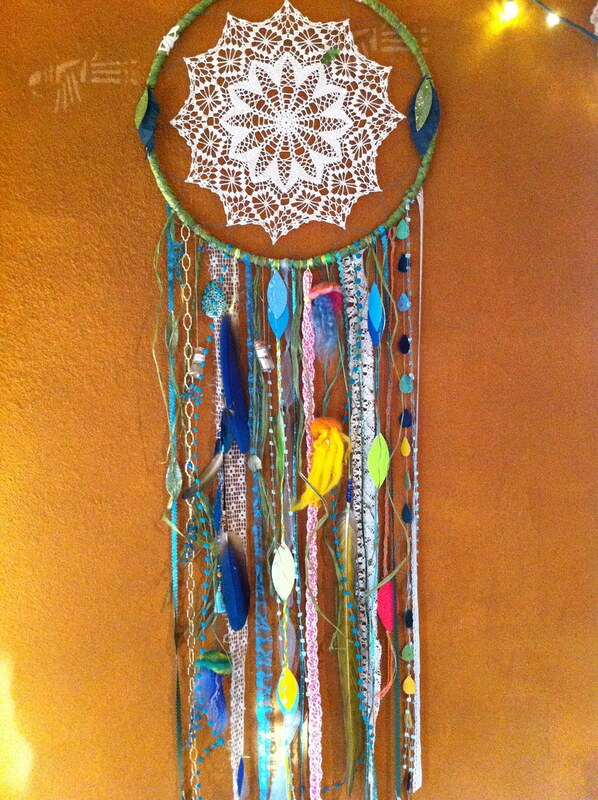 This is the one I decided to do with lace and that it would represent my essence. I love this for its purity and innocence and femininity. It is lacy, made with white feathers I picked up from walks and the aviary, dreamy tulle, silver and frosted beads, pearls, and I made some tassels. I think I will do more like this....loving the tassels and the lace! 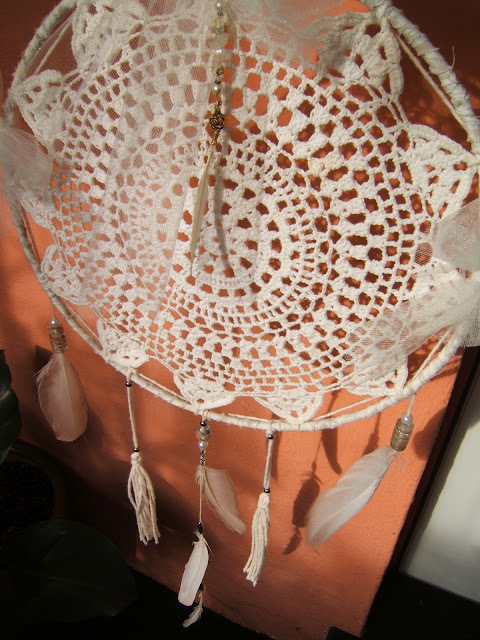 Ozma of Odds gives a lovely tutorial on how to make some similar to these, she is totally amazing!If you have not been to her site please do go, you will swoon or drool, or both. She offers lots of tutorials on her whimsy! If you have not been there, tell her I sent you. She has such a beautiful soul, and her love of white is ...well.....''catching''......hummm.....yes, just like a dream ! This one is unfinished as I see myself adding more to it, the more I feel my own soul from my Magical Eyes. It reminds me of the gentleness and pure Beauty there. 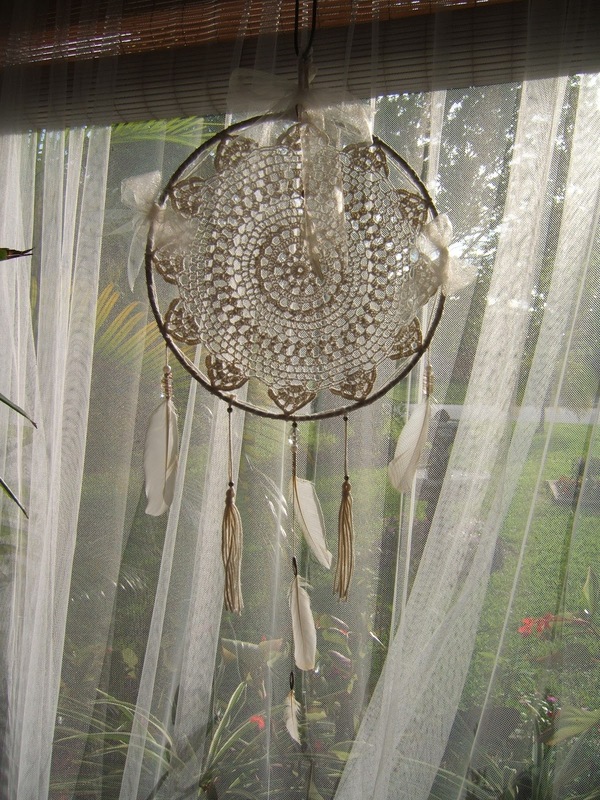 This is my Spiritual Essence DreamCatcher. Another site for Rachel Rice . Check our her video tutorial ! and an artist gathering where people made their own. 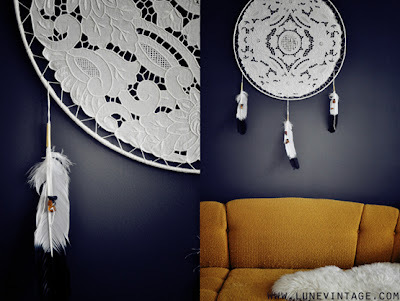 I Love this wall of dreamcatchers from here: Dosen't she look like she's trying to catch a dream ? It is wonderful to make things yourself with your own hands, in ways that are unique to your own creativity. I encourage everyone to make something whimsical for themselves, and for others. Even if you don't know how, just play....play with the materials, especially materials you already have lying around.....and see what you come up with.....using your own magical eye, your own imagination..........these are the most magical pieces of all because they are uniquely you! I'm so glad....inspiring others is why I'm online, :D and to get some inspiration too which there is no shortage of in blogland ! lovin it ! You have so inspired me! I love this post. 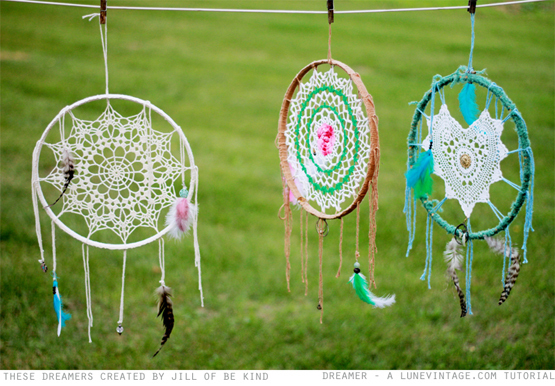 Now I really want to make a dream catcher! I can't wait to see yours! I just KNOW it will be gorgeous! can't wait to see yours too Linda, everything you do is so beautifully artistic and well done! :D lovin it. I try to make sure I am talented in most things I need to live......so I'm not dependent on others....a life grown up in so called "poverty" gave me this ambition. Besides, I love making things myself, I think I have better ideas....until I met the ladies of blogland this past November! boy what a world of talented gifted and beautiful ladies!!!! 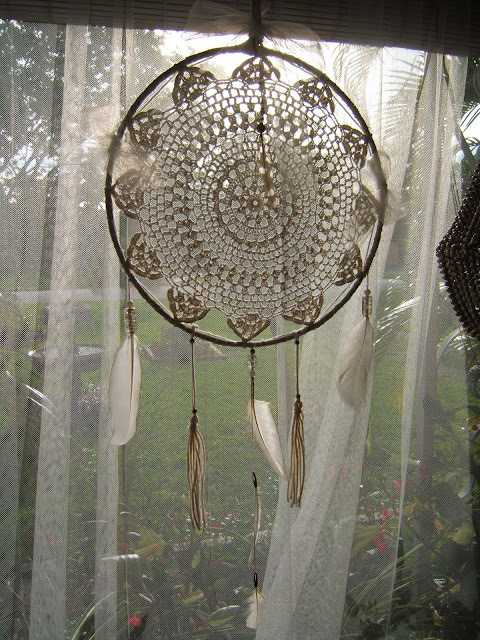 Dreaming....I dream too much...way too much, its even exhausting for me. So I tried everything to stop it but it won't. 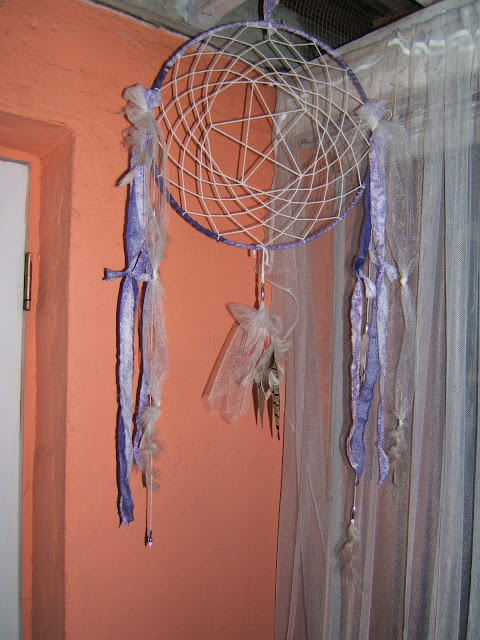 I think, in jungian terms, the dreaming may be such a busy mind needing to release its "contents" if you will and they come out all convoluted through dreams? only a theory of mine. I just with I could sleep all night, wake up rested, and not remember anything. 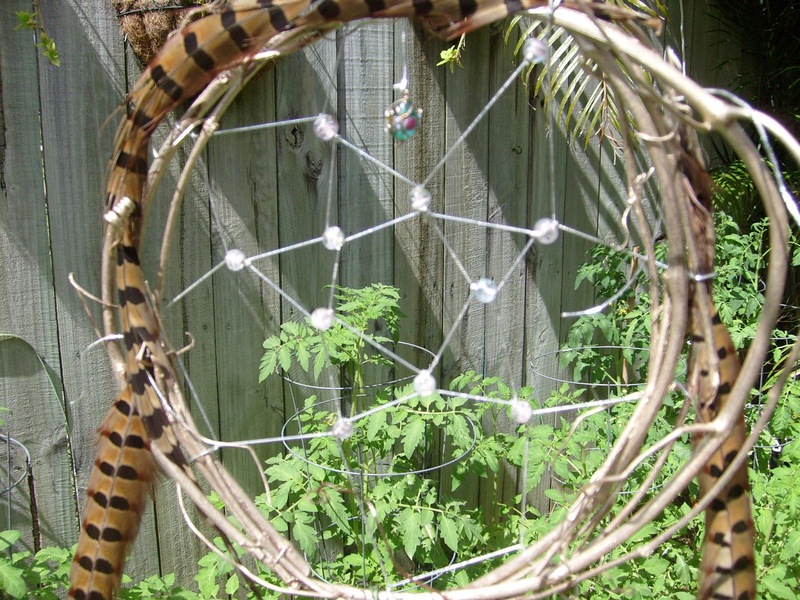 What beautiful dreamcatchers! Love your blog. New Follower. Thank you. I went to your blog too and I love what you're doing too...especially that you do it with Stan...a couple blogging together! what a lovely thing! on yours!! Thanks so much for sharing! Oh I do love the Bohemian colors! Very fun! Thank you for joining me at Home Sweet Home!